Break Pool Cues - Does Weight Really Matter? Do light or heavy break pool cues result in better breaks ? That’s a question many people wonder. A good break is one in which the balls scatter and none are left touching another and starting the game with a good break is extremely important. Initially, you might think using a heavy weighted cue for the break would be best. Theoretically, that makes sense, to get the most power for your break. But first, you need to understand the weights of different cue sticks. The average weight would be 19 oz., a light cue is 18 oz and a heavy cue is 20 oz. or more. Past experience has shown me that it really comes down to personal preference. However, many argue that it is all about physics. When it comes to the weight of break pool cues, simple physics should be considered. A simple equation to remember is mass times velocity.What does that mean? I’m glad you asked. 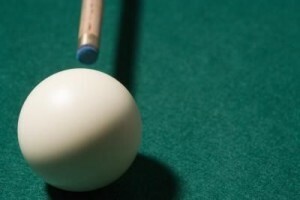 The speed of the cue ball is what matters when breaking. The mass is referring to the object being propelled – in this case it would be the cue ball, which weighs 6 oz. The velocity is the way in which we propel the cue. So what we need to be concerned with is how fast we can propel the cue ball with the most control, instead of the power behind it. Heavy break pool cues result in more force, creating more momentum. However, light cues allow you more acceleration. After taking all this into consideration, they both seem to have their advantages, which once is left to personal preference. The force behind your shot will not only be determined by the weight of the cue, but by your style and positioning. Regardless of the weight being used, the power comes more from a solid contact on the cue and proper grip and stance. Try both light and heavy break pool cues with slight alterations in your stance and positioning. You will find which is most comfortable and effective. The more you experiment, the more proficient your break will become, whether it’s based on the laws of physics or personal preference. When learning new techniques, always remember to master the basics first. Find your comfortable position and grip when breaking and master that approach before attempting to become a power breaker. Also click here to see the best pool cues.